Akrotiri Peninsula lies just 10km away from the main city of Chania. The best thing about Akrotiri is it remains largely untouched by tourism, with quaint little villages nestling close to the coastline or sitting proudly in the hillside. You will find a lot of villages around Akrotiri and some amazing white sandy beaches, where you will find yourselves the only person on the beach. The most famous village is that of Stavros where parts of Zorba the Greek were filmed. Another point of interest that attracts people to the area of Akrotiri is the catacombs, tombs and caves in the area as well as some easily walk able gorges and ravines. The Akrotiri Peninsula, its charming villages and rugged scenery is a must for people who want to see a little of the real Crete. The peninsula or Akrotiri which interestingly is the Greek name meaning “The Cape” hold 20 villages sprawled out over the area, in turn the villages amass a total population of around 10,000 people between them. The town hall which covers this area sits in the village of Pithari, and it sits just 6.5km from Chania. 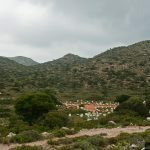 The other villages in this area are Horafakia, Kalathas, Kampani, Stavros, Kalorouma, Hordaki, Agia Zoni, Sternes, Kounoupidiana, Mouzouras, Korakies, Argoylides, Aroni, Agios Nikolaos, Pazinos (or Paxinos), Anemomyloi, Marathi, Kathiana, Profitis Ilias and Rizosklopo. 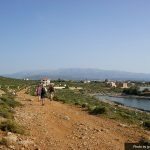 The area is quite flat, but there are some slightly mountainous areas, split with ravines and gorges, the coastline is quite rocky and rugged but the upside of this is the fact you can find quiet sandy coves protected from the Cretan winds, and also provides some excellent areas to go snorkelling and fishing from. 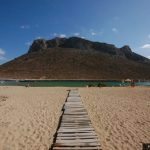 The small village and beach of Stavros is where they filmed parts of the movie “Zorba the Greek” with the final part of the movie being filmed on the beach pictured below with the mountainous hill in the background. Going walking into the hills you can find some interesting caves, with excellent rock formations with wonderful stalagmites and stalactites. These caves have been proven to be a place of worship and also shelter from the many pirates who attacked this peninsula over the years. As mentioned earlier there are only a few well known beaches within the Akrotiri peninsula, all of these beaches are awarded the Blue Flag beach award year on year. 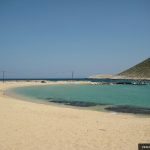 The main beaches are Stavros beach, Marathi beach, Tersanas &Maherida beaches, Agios Onoufrios beach, Loutraki beach and the beach of Kalathas. Although some of the beaches are small, most have local Tavernas offering excellent Greek dishes including freshly caught Octopus, fish and even the local delicacy of sea urchin. Some of the beaches have small hotels you can book locally, currently Holidays2Crete offer one hotel within the Akrotiri peninsula called Aloni Suites which offers direct access to most of the beaches and sights mentioned within this feature. If you want to explore the area more and look for hidden coves then we suggest hiring out a car, you can traverse most of the Akrotiri peninsula in a day, the roads in most places are well kept, and also there is a local bus service that runs from the major beaches. 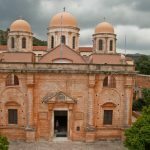 A lot of visitors to Crete come to see the amazing architecture of the many monasteries and churches that are spread through the Cretan countryside. The area of Akrotiri peninsula is “blessed” with many fine churches, many from the Byzantine era with frescos and golden artwork adorning them as they did many over 500 years ago. 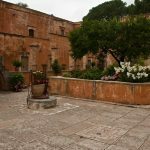 One fine example is the Monastery of Aghia Triada of Tzagaroli situated on the northwest of Akrotiri, open almost daily with a small museum. 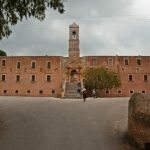 Also search out the Nuns’ Monastery of Agios Ioannis, a 17th century building near Korakies. 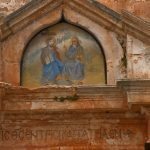 Some other churches you may want to visit are Agios Ioannis the Hermit – Katholiko, which is considered the oldest monastery in Crete dating from the 6th century. 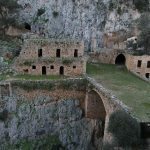 Also try taking a visit to Cavernous Church of Agios Georgios Apidiotis located in the gorge of Mavre, near Pazinos village. For some excellent photo opportunities a visit to Kalogreon Monastery which is pictured on the bottom right with the lovely flora cascading from the monastery. If you time it right when you visit Akrotiri you will also see the local carnival that is held in march every year, its a wonderful sight and a great time to visit Akrotiri.